The goal of every student in the tertiary level education is a career path that eventually improves the quality of life. The tool to achieve this goal is a challenge that all academic institutions recognize and competitively try to offer. Academic excellence becomes a drum-beater for all schools that boast of quality education. Learning is a dynamic process that entails holistic development of a human being. 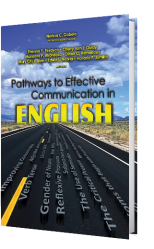 Anchored on this vision, this book sets the benchmark for the comprehensive, practical and communicative learning of the English language. 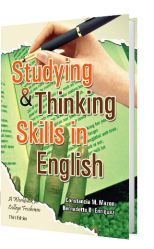 This book aims to set the students to achieve mastery of the English language through a ladderized approach–interrelated lessons that are arranged from the simplest to the most complex—keeping in mind how the human brain functions best when ideas are placed in good order. This book is divided into two major parts—Structure of the English Grammar and Paragraph Development. Each part of the book is designed with learning elements that are distinctly adaptive to the lessons' content. Part 1 – Structure of the English Grammar focuses on the comprehensive discussion of the eight parts of speech and introductory lessons on writing elements and writing mechanics. Each lesson contains Stumbling Blocks that serves as both diagnostic testing and lesson springboard for the students. The Path Finders is a comprehensive discussion of the lesson with numerous examples to ensure complete understanding of the lesson. The Learning Alley is the part where the students get to evaluate their understanding of the lesson through two sets of exercises that provide a variety of assessment.